You guys'll love this week's Sewing Circle. This Rachel Gilbert sequin evening dress is totally amazing, but the coolest part is, you can make one just like it yourself! Q: I fell in love with this dress when I saw it on Pinterest several weeks ago. I would love to make this and was wondering if you have ever come across a pattern or two that would help complete this amazing Rachel Gilbert sequin dress. 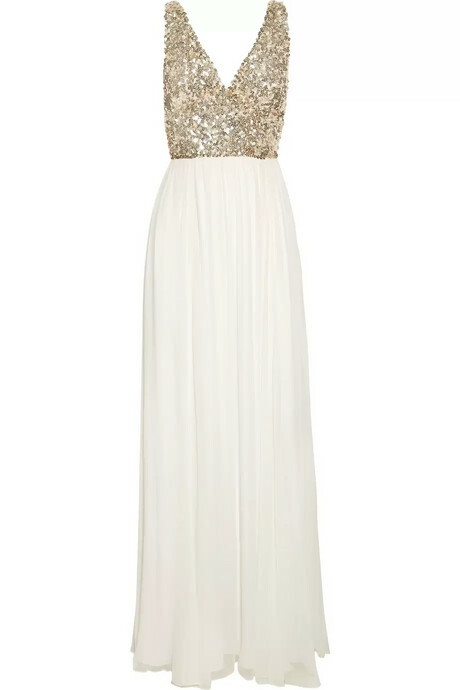 A: That is an amazing dress! The first thing I notice is the shape of the bodice, and I know I’ve seen patterns like it before. It has a rounded midriff panel and what looks like a slight crossover v-neck made with right and left sides. The waist seems to hit just barely above the natural waist—very flattering, and you can get the right proportions with ANY pattern with a midriff panel. You’ll just cut it to the right size for your body and this style. So some of the patterns I’ve seen have wider or narrower panels, some that look like waistbands—don’t worry about that. Very easy to change when you cut. New Look 6557. I learned how to sew dresses on this pattern! Super easy. 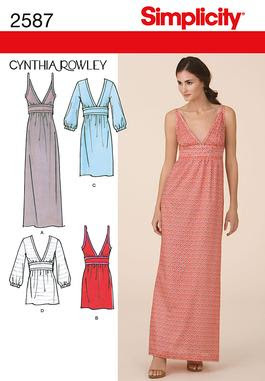 You could use the red/white pattered dress style but give it a slightly higher waistline. New Look 6774. There are a lot of pieces in there, but the simple crossover shown in peach second from the left would do. McCall’s M6557. Again, extend the midriff panel to the natural waist. 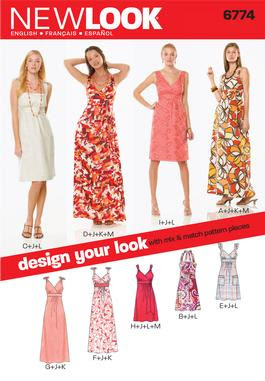 Same deal with Simplicity 2549. 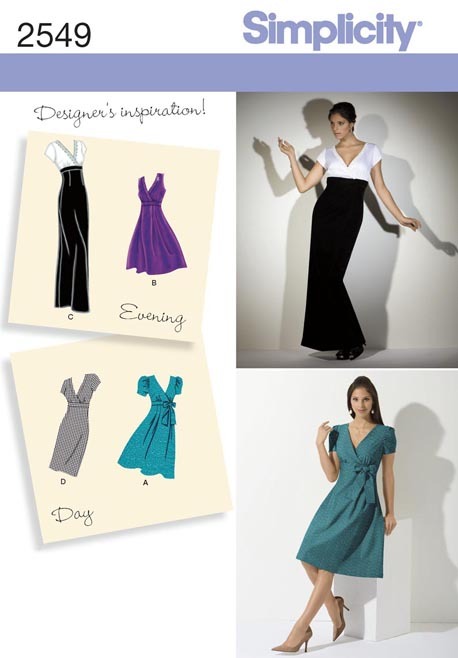 Butterick B4915. Another one of my old faves and a great basic pattern! I think it’s also out of print but you could maybe find it for sale online. As for the rest of the dress… Looks like the skirt is made of crinkled silk chiffon--just lovely! But if your budget doesn't allow, I'd use a poly crinkle chiffon and put it over a nice, not too thin, rayon or nylon lining. Oh, and the pattern for the skirt? You don’t need one. 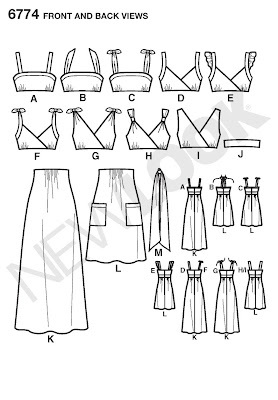 Measure from your waist (or wherever the bodice ends) to the floor, or wherever you want the skirt to stop. Add ½” at the top for the seam allowance, and just over an inch at the bottom for a small hem. I would cut two panels, I think? If you have 45” wide fabric, you’ll have 90” around minus seam allowances. I would cut the same of the lining, but about 1” shorter. I think you can totally pull this DIY off! Readers--which patterns get your vote? Any ideas on where to find that great sequin fabric? When I made this sequin dress I recycled it from a cheap sequin top, and I have seen sequined stuff in sponsor Sew What's New's store. But I'd love to hear any other sources you may know of! I'm going to second getting a sequin shirt from the thrift store and re-purposing it for the dress. I see sequins at Goodwill all the time! Or if I couldn't find it there, I'd probably get a Joann's coupon and get the cheap stretchy stuff. As for the skirt, I'm a sucker for silk (dislike poly), so I would want the maker to think about where she'll be wearing it...if it's during a hot summer day, silk would be better. But a cool evening night poly would probably fine! I'm waiting for the day that someone makes (and shares) something based off of these sewing circles. You would obviously have to post the results! Good points on the sequins and skirt material!! Hm, I think a few times people have sent me pics... I'll have to look! And you're right, it would be fun to post! Definitely, me too!! Summer dresses are the most fun to make. Such a beautiful dress! Sewing with sequin fabric intimidates me, but with a fairly simple shape maybe this would be a good project to start with. Sequin fabric does require a strong needle, but more than anything it's just messy! They fly off and are everywhere when you cut! I am looking at making this exact dress for my wedding and stumbled onto this page! Any thoughts on making the top from a pattern and then hand sewing the sequins? What sort of underneath fabric should I use in that case? Lovely! You could use a basic fabric for the top (I would go with a cotton sateen for the bodice, for a summer wedding, but I'm not too fancy... alternatively, maybe a heavier silk or poly) and embroider the sequins if you're very patient. But check out the bridal section of your fabric store; they may have something already sequined and you don't need much, so it shouldn't be toooo expensive. All in all, how expensive do you guys think it would be to make this? I can't sew, so I'd be looking to have someone make it for me. Well, hard to say. If you make it yourself, it's just the cost of the materials (depending where you buy them and how many coupons you use, $20-60, probably. Then if you pay someone, $10-20/hour, and if there's any markup or overhead, it could be pretty high. It's often cheaper just to buy something like this from a favorite store or website than to have it custom made, unless you have a seamstress friend! Stunning. Working with sequins for the first time myself and had read that you had to pick the sequins out of the seam allowances and not actually sew through them. Talk about messy. What's your experience with this? Have you been able to sew right through them? What about sequins sewn on a sort of stretchy knit?! Thanks! I did sew through some of the sequins, but on the bodice if they're not protected by a lining, they'll be poky and scratchy on the inside. And you'd have to use a strong needle. The net of this shirt was pretty lightweight and stretchy, but since I interlined it--used another layer of fabric behind it and treated them as one piece for each pattern piece--it was reinforced.